If we are to believe scientists, the cosmos as we know it was initially created by a Big Bang. Generally, in the universe everything revolves around explosions, both when the stars are created and destroyed. But don’t you worry about cataclysmic nuclear explosions right now, since we won’t be dealing with that kind of Novae in this text. Truth being told, RTG did use Nova as the main theme for product called Nova 7, but the only explosion you can expect is the cash explosion. Gamers will witness the amazing beauty of cosmos, with planets, stars and solar systems appearing on the reels, since the 2016 release is set on one of the dying stars in outer space, so you better prepare your spacesuit. The amazing visuals are followed by a dramatic soundtrack that will definitely mount the tension up, as you try to land Red 7 Wilds and Blue 7 Scatters in order to trigger one of several intergalactic special features. Put that spacesuit on, since this stellar adventure is about to commence. As you sit on one of the dying cosmic suns, the view will certainly blow you away. The never-ending outer space will stand in all its might right before you, while the planets of this solar system spread around. A planet quite resembling Earth is in the central place, while the sun is setting down behind her. Apart from planets, stars and solar systems occupying the reels, the most important symbols in the RTG product are the Red 7 Wild and Blue 7 Scatter, which both bring lots of additional features. 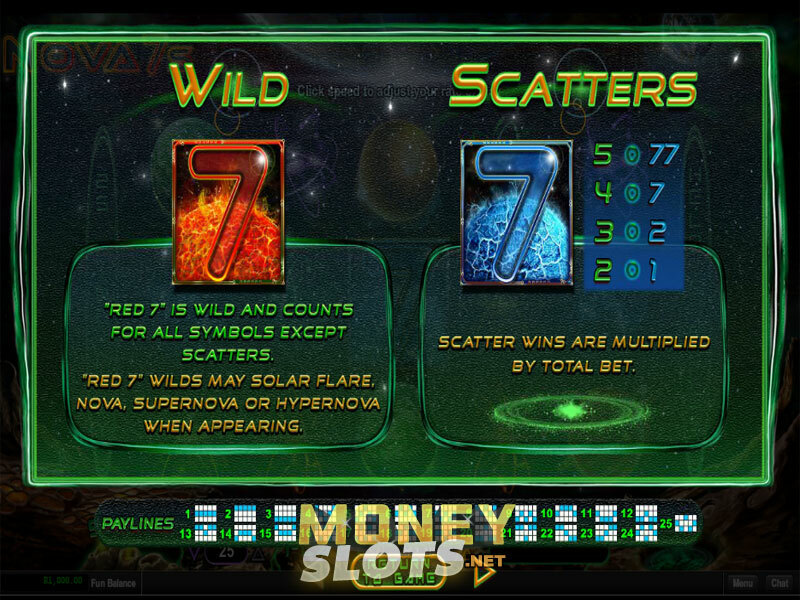 Before you start this intergalactic journey, choose the number of paylines you want to play with, since this five-reel, three-row slot offers 25 of adjustable paylines. After you set the desired bet somewhere between $0.01 and $125, you are ready to hit the Spin button, set on a green-looking lava, or activate the Autospin feature, if you just want to sit back and enjoy the view. If you want to speed things up a bit, there are three Speed levels available on the bottom left corner of the screen. All symbols, including Scatters, pay left to right, starting from the leftmost reel, so gamers need to land at least three matching symbols on a payline to land a winning combination. The Red Planet pays the most, 777 coins for five of a kind. The Red 7 is a Wild and substitutes for all symbols except Blue 7 Scatters, which trigger the Free Game feature. When you land the Red 7 Wilds on reels 2 and 4, they may “solar flare”, or turning into Expanding Wilds that cover the entire reel. The solar flare can easily turn into a hypernova, meaning that Expanding Wilds from reels 2 and 4 can also cover reels 1 and 5. If landed on reel 3, the Wild might nova, which means it may multiply the winning combination 7 times. When it supernovas, the Wild appears on reel 3, awards a 7x multiplier and covers the entire reel. Spinners will need at least three Blue 7 Scatters on adjacent reels, starting from the far left reel, if they want to trigger the Free Game feature, offering 4 different options. Nova 7 feature awards gamers with 7 freebies with extra Wilds on reels 2, 3 and 4. This feature can be retriggered. Supernova 7 consists of the Nova 7 feature, with the addition of a 7x multiplier on all wins. In Hypernova 7 feature you get Nova 7, Supernova 7, plus a re-spin triggered every time the Wild expands over reel 3. In Hypernova Extreme, any Wild appearing on reel 3 will expand all ways. For those of you who like to explore the wonder of outer space and the power of novas on mobile devices, Realtime Gaming also prepared a mobile version of the 2016 release. Available on Android and iOS platforms, Nova 7s can be enjoyed on the move and we can honestly say that the RTG release loses none of its appeal when being played on tablet or smartphone.